Cycling guided by the experts maps, but at your own pace and spirit of adventure: the best way to discover the heel of Italy in a week. Salento is the easternmost region of Italy lying in the so-called "heel of the boot". Situated in the centre of the Mediterranean Sea, this region is filled with memories of several populations, from the Messapii, to the Greeks, followed by the Romans and then the Normans. Salento is also internationally renowned for its traditional cuisine and folk music, called Pizzica. You will be cycling between 30 and 50 km per day, mainly through secondary roads, with seaside or photo stops, guided visits and Italian lessons. The philosophy behind these holidays is the “slow tour” to fully enjoy the landscape and culture with all their different aspects. Route is flat with many interesting cultural and naturalistic sights. After the guided tour, you´ll move towards Giurdignano, crossing a Bronze age megalithic park containing huge stones called “dolmen” and “menhir”. Then, you´ll visit “La Cutura” botanic garden with its incredible plants collection (unique in Europe for its cactus species) and you will be offered some lunch. In the afternoon, you´ll enjoy a visit to a traditional stone-made oven and local products tasting. After an astonishing defense tower located in the centre of a small village, you´ll visit an ancient mill and an enigmatic funerary monument made by big stones (its name “centopietre” means “hundred stones”). Finally you´ll reach Leuca piccola (little Leuca), an important pilgrimage station which still maintains a vast undergound area. Through olive groves and dry stone walls you´ll reach Ugento, where you may visit its archaeological museum. 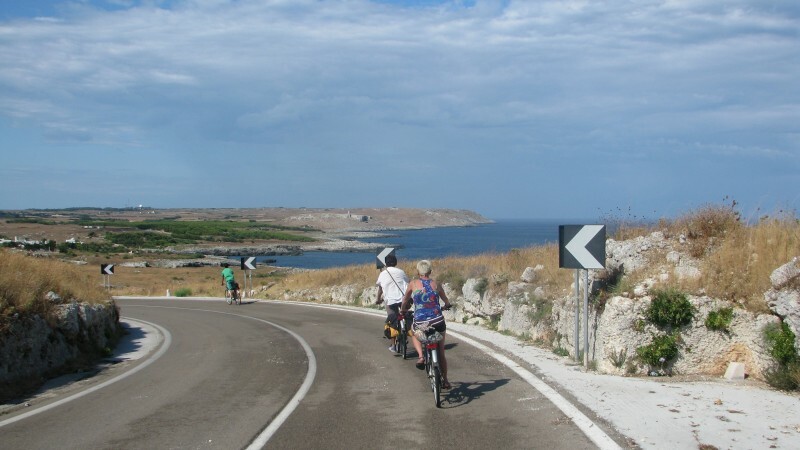 In the afternoon you will cycle again along the Ionian coast towards St. Andrew’s island and Punta Pizzo natural park. Once in Gallipoli, fisherman village located on a peninsula, you can enjoy an aperitif on a terrace overlooking the sea. Then you´ll move to Tuglie and the amazing “rural culture museum” to move on to Galatone and its beautiful Baroque old town with the Norman castle of Fulcignano. You´ll visit Nardò baroque old town and discover Copertino with its impressive Norman castle and its stories about St Joseph, the saint of fligths.